An Original Camille Minichino Miniature! 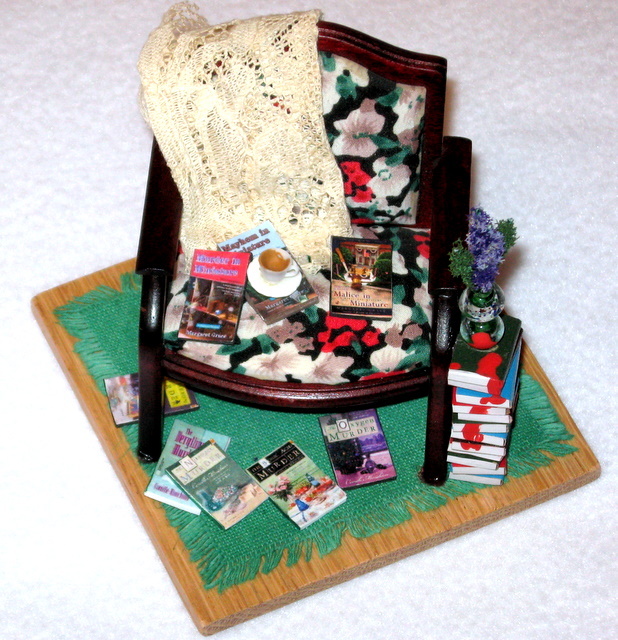 I am happy to be able to “show and tell” my latest Cozy Mystery item: an original Camille Minichino miniature crime scene. I am so delighted with this crime scene… I have placed it on the shelf right above my computer screen, so that I can look up and get inspiration while writing my entries. Believe me >>> I need a lot of inspiration sometimes! I live in Texas, and the Bluebonnet is our state flower. Yep, those are Bluebonnets in the blood-covered vase on top of the TBR stack of books. As an avid coffee drinker, I was quite happy to see that yes, that’s coffee in the cup. Thank you so much, Ms. Minichino! Fantastic looking miniature. Thanks for sharing it. I’ve read the miniature series and it is also good. I especially like that it includes the local library and the Friends of the library. I know, Dennis, isn’t that neat?!? Thanks for sharing this, Danna! It was a lot of fun putting it together.